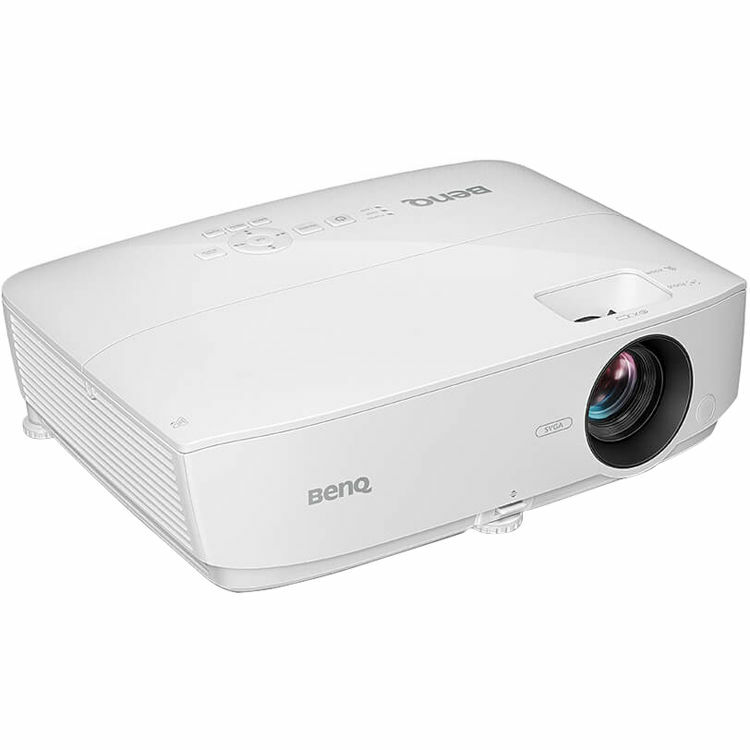 Show your presentations in most small meeting rooms with the BenQ MS535A 3600-Lumen SVGA DLP Projector. Its 3600 lumens of brightness will overcome ambient light in many situations, while its 15,000:1 dynamic contrast ratio will help keep images and text clear and distinct. Its 1.94 to 2.32:1 throw ratio and 1.2x zoom offer a range of installation options. The MS535A has RCA composite, S-Video, two HDMI, and two VGA inputs to support various types of video sources. Its VGA output will allow you to daisy-chain multiple projectors or displays to allow them to show the same video source. A built-in 2W speaker eliminates the need for a separate speaker system, but the projector also features an 1/8" audio output to connect external speakers. It is controllable via USB or RS-232 and includes a VGA cable and IR remote control. The brightness of 3600 lumens is designed to allow comfortable lights-on presentations to help promote discussion, collaboration, and note-taking in small, well-lit meeting rooms accommodating up to 10 participants. This brightness level helps boost picture quality with vibrant color for pictures and videos as well as crisp text and fine details. The MS535A features a 15,000:1 dynamic contrast ratio to help it produce true blacks and enhanced readability for individual characters and overall images. A high fill factor helps augment clarity for images and reduces eye strain for presenters and audiences to stay focused on the content. Dual HDMI and dual VGA inputs allow multiple presenters to connect their devices without having to take turns or swap wires, allowing for quick, convenient collaboration. Countering the trapezoid effect when the projector is placed off-center from the projection surface, such as placement on top of a table, vertical keystone correction adjusts the image to properly square it, making it easy to project from a variety of locations. Having three adjustable feet helps enhance flexibility in a variety of meeting rooms, with the additional feet at the corners of the projector to help facilitate easy movement to start projecting quickly. The remote features a dedicated Quick Install button, which is designed to instantly access installation-friendly functions, such as Test Pattern and Keystone directly without searching through menus in the on-screen display. The lamp replacement door is designed to allow for fast lamp replacement for virtually uninterrupted productivity when the projector is ceiling-mounted. SmartEco Mode is designed to analyze input content to determine the brightness required for optimal color and contrast performance, conserving up to 70% of lamp power without compromising image quality. Eco Blank Mode is engineered to automatically activate after three minutes of inactivity with no source content to save energy and eliminate distractions. Auto Power Off enables the projector to power down after 20 minutes of inactivity to minimize energy waste and projector life concerns. When inactive, the MS535A uses just 0.5W, further enhancing energy savings. Designed to help secure tabletop projectors, the cable lock interface provides the capability to connect an optional cable lock; a security bar is also onboard to deter opportunistic thieves. Box Dimensions (LxWxH) 16.5 x 13.0 x 5.9"